It's a Really Long Way Down: Long time no post! Goodness. That's a lot of updates. Looking forward to pictures. My short, fat gelding and I have been showing this year - a lot. I'm determined to make a real effort. He's getting calmer the more we go out. I've been blogging about it. Hey, 'bout time! Glad to have you 'back'! Well, so much has happened around here, I don't even know where to start. My mom sold her grey mare, Sasha, to a girl who doesn't have the fear issues that Mom does, and can take control and have patience with her occasional stubbornness. Then, she bought a Kentucky Mountain Horse gelding, SIGHT UN-SEEN and BY HERSELF (no input from me whatsoever, she didn't' even tell me about him until he was on his way home). Turns out that the sellers doped him, and once the drugs wore off at his new home, he turned into a complete skitzo. Major wires are crossed somewhere in his brain. Scared of people, high flight reflex, and pretty much a total danger to her and himself. Not sure what we're going to do with him just yet. I just don't have the time, nor inclination to deal with all of the issues that he has. We have him advertised for sale as needing an experienced handler, but as the inquiries come in and we tell the truth, the whole truth, and nothing but the truth, so help us God, they quickly lose interest. He might end up being a pasture pet, or hopefully I can convince my mother to euth. That's how bad he is. I went with her this past weekend to look at a different horse, and ended up giving her the 'go ahead' to buy him. He's an 18 year old Racking Horse gelding. Been there, done that, got AWESOME legs and feet, a little long in the back and slightly downhill, but nothing major. He's got a really nice attitude, and I think they're going to get along famously as long as she can get some guns to stick to. The price was right, $400 - that just goes to show that if you look hard enough and know WHAT you're looking for, the really good beginner horses ARE out there! On a sadder note, I made the decision to euth my old gelding this coming fall. After struggling to keep him sound for the past year, I've decided that it's time. He has navicular, confirmed by x-rays. His good days are being outnumbered by the bad, and it's time to do right by him. He's been my best friend since I was 15 years old. So, when I'm ready, I'm going to be keeping an eye out for a new project. I'd like to get one of those mutt grey draft ponies, but I'd like one with a tail. :) So, this fall I'm going to start interviewing breeders in my area, and IF I find one that I like, I'll order a colt from the next foal crop. We'll see how that goes. Oh wow, thanks for all the updates! Glad to hear the VLC is coming along soooo nicely! The SOG (slightly odd gelding) has found his niche as an endurance horse for sure. He had his third race yesterday, and despite taking a fall and scraping up both knees early on, was eager to finish all 50 miles. Since he didn't seem to be hurting at all, we took the option to continue, and he finished 2nd! We would have put him up for Best Condition, but for the "playground knees" he would have been dinged too much, so didn't bother. He gets to rest and be treated like royalty this week (exept for a dentist appointment on Wednesday). As for myself, one of the original ArenaWeenies, I've been doing field rides and the occasional trail ride - and actually enjoying them! We have progressed to where I can ride the SOG alone out in the field without puking, crying or shaking, and I actually CANTERED him last week - I'm embarrassed to admit I've now owned him 19 months and that's the first time I've cantered on him. It was pure HEAVEN. In 30+ years of riding, I've NEVER ridden smoother gaits than my boy's! We've gone through fear, genuine hatred, more fear, and a whole lot of agony of all sorts, and I'm so happy to say I'm finally loving my horse. I'm glad I didn't give up on him. Icing on the cake: Saturday will be my 42nd (gasp) birthday, and Sunday I will attempt to ride him in MY first Limited Distance ride. 25 miles seems like SUCH a long way today, and I'm very apprehensive, but we're gonna try it. Wish me luck? Well since you ask, I am sitting on a bucket soaking a mare's hoof in Lysol and listening to distant thunder. I dodged the bloodletting that was the 2009 TB yearling sale and now have two yearlings to star myself, if things don't get better. I am using the yearlings and my mentally scarred mare Bon Appeal in a book about progressive horsemanship. Wow... it sounds like this has been a busy horse summer for everyone. That's certainly been true for me, as well. Where to start? Two of my four former broodmares have sold to new homes. Capri went to live in Florida (lucky girl), and Cressie went to live in Illinois with a couple who breed and race Standardbreds. She may end up being a part-time sidesaddle horse, which is uber-cool because I am also a sidesaddle enthusiast. 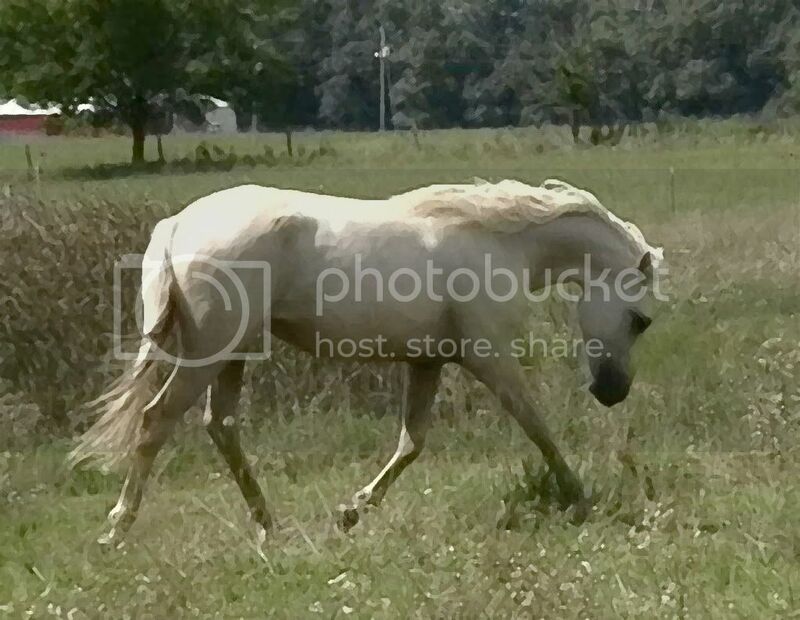 Next on the list for sale is my three year old palomino Andalusian/Arabian gelding Caz, who is just starting work under saddle with my trainer (the rider in the mares' videos). It's been interesting, tailoring the training and, perhaps even more, the marketing, to the audience for each individual horse. Capri was a reining prospect, but we figured she might end up in a trail riding home. Cressie was never going to burn up the show arena, so she was always going to a trail/pleasure home, hence video of bouncing a big ball off of her back, standing on a tarp, standing on her, and all of the other stuff that Fugly loves so much. ;-) She's a quiet but pretty Arabian mare, and that's what her potential buyers were going to be looking for-- quiet, but pretty. Caz, on the other hand, is a dressage prospect, and so the buyers want to see this. That's his older half sister, by the way, also and Arabian cross-- and not owned by me. As far as my personal horse accomplishments go this summer, by far the proudest is winning first place at one of the Pine Dell Versatility Challenges by riding bridleless--I took the headgear off after the first obstacle, when it became obvious that Tucker was tuned in and "with me". What a great natural horsemanship event-- it's laid back, everyone is friendly and supportive, and yet there is still a very respectable cash payout for first, second, and third place ($100, $60, $40). These type of events seem to be popping up in several different areas of the country, and I've got to say, it's almost enough to tempt me back into serious showing. :-) The only depressing thing about it is that, watching the video, I'm starting to *look* like an old woman as well as *feeling* like one. Oy. Lastly, with two of the mares gone and my wonderful trainer Tori picking up the slack with the three-year-old, I've had more time to focus on the two-year-old Andalusian/Arabian filly that I'm keeping for myself. I've just started ground driving her, and need to decide if I'm going to send her to the driving trainer that my parents used to start their Friesian cross in harness when he was two. Well, that's about it... great to have a chance to catch up on news with everyone! icepony - Now that IS cool, both the first canter and congrats on the birthday. We are the same age! Well there you are. I'm so glad to hear how the VLC is doing. I mean, can't we keep his name? It could stand for Volumnous Lazy Cuddle- bug couldn't it? How do I change my password on the other blog? I can't post!!!! OK, I wrote a lovely little post, saying how glad I was to see you're writing here again, posted it and it's not here. Whazzup with that? Sorry, everything's moderated now. I've had enough with hosting an asylum. It got old. Back to talking about horses! Everyone's been so busy! Wish I could say the same. I rode more this week than I have all summer! Same horse, two days in a row. It's a RECORD!!! Poor horse si thinking "What the heck, mom?" Ah well, those appys are tough, right? The main reason I've been off horses is because of the insane number of horse related accidents and deaths since March. These are barrel racing folks, most I don't know, ALL of them are experience horse people who start, ride, and race youngsters every year. So that's got me a little spooked. And since I don't have a riding partner, I haven't been riding. Honey is officially retired to pasture. I thought I was going to ride her, but she just can't handle the weight. She can rip around the pasture with "the kids", but add any weight and it's obvious that she's uncomfortable. So, she is my stunning dark bay former race horse that is the absolutely BEST cuddlebug on the planet. I SO love this mare! Millie, my 2 yr old, was saddled for the first time in June. She had 15 seconds of NFR eligible bucking, then stopped, looked around, and was over it. I wish I could find someone here close to teach me how to ground drive. I'd really like to work on that! Bullwinkle live next to Honey. He is a HUGE obnoxious monster! And I say that lovingly! I'd forgot how percoscious (sp?) and obnoxious babies are! If the electric tape fence isn't on, he pushes through to terrorize Honey and Millie. Jazzy She's only 8 yrs old. And since she's not registered QH (long story involving seizure and refusal of papers), she won't be bred. She's a BIG grullo mare cuddly and easy to handle. Available for adoption to the right home. Jinx - the new girl. 17 yr old Missouri Fox Trotter bought for my husband right before Hades open it's door and released the inferno on Pasco. It's been too dang hot to ride her, though the three times we were able to, she rode like a dream! Angel - my slimmed down little appy. Still full of appy-tude, still ugly as a mud fence, still the love of my life! Squirrel - She got kicked and is just now ready to go back to riding. She's fresh and fat, and to be honest, spooks me a little. I'm having confidence issues with this mare, though she's never done anything "bad". Beau - the new rescue. Sweet, kind, starved. He has sort of taken over my blog. Wow...I thought I was the only 40 something re-rider. Top that with a total breed/type/size changefrom Arabian/Half-Arabians to OTTB. The confidence is coming back and I wouldn't have adopted any other horse in the world. It was great to find your blog. As another 40 something re-rider, it's great to know I'm not the only one around. When I first started working with my 16.3 hand OTTB I thought I might have made a mistake becuase I grew up riding/showing Arabians/Half-Arabians and this was a different creature. Fortunately, it's going great and I wouldn't trade him for any other horse/breed. Glad to hear about the VLC! I've spent the past few months in training and really gaining confidence with maresy and I am now convinced she's the horse I want. It's been very expensive so I am backing off arena work for the winter and moving her to a place that is next to an 1100 acre state forest! We'll still have lessons, but no "full training" and heck, it's New England so a certain amount of time is going to be spent in the indoor no matter what, sigh. I've been riding her on the road as a confidence-builder and to get more in tune with what might be going on *before* she spooks (hint: watch those cute little Morgan ears!) She is actually a very good road horse. We also provided comic relief at a Linda Zang dressage clinic, where maresy decided that everything was scary and worth a spook... rode her through it all with Linda coaching, and ended on a very good note with canter and counter-canter. My best guess is 1/2 Arab, 1/2 Paint, as he is definately "colored", with a Quarter Horse type hip/chest and an Arab head, for sure. Wish me luck! He seems like a really eager to please little guy, so I think I'm gonna have fun with him. Haven't done much other than establish a few "ground rules" so far. I heard it was a train wreck :-( I was almost thinking things would be a little better - I keep HEARING how the economy is recovering but I certainly don't see it affecting horses yet. The horse industry is still in a tailspin except that, thank heavens, the price of hay came down. Quietann - I LOVE horses with working "antennae" like that - the ones who will offload you are the ones that spook with no warning! Char - Good luck with the new guy! Hey! Glad to see your back. I was beginning to wonder if the VLC had been snatched by aliens, and therefore there were no updates as to his progress. I can't wait to hear how he does in the show ring. Updates, well, lets see. It's been a busy few months. I had to put my 15 year old Paso down, he had gone blind and was spending his time either refusing to move, or panicking and breaking halters, fences, and one picnic table. It was the hardest thing I've ever done, but for his safety and mental wellbeing, it was the best thing. I then picked up my dogs, cats, and remaining horse and moved with my husband from Florida to Maryland. We are here now. Merlin, my little Arab/Paso cross gelding is doing great up here. He's had a major life change, but seems to be handling it very well. He certaintly enjoys the grass here! Because of the chaos in my life, his training really hasn't progressed, and I'm just now getting back to working him regularly, so we'll just see how he does over the next few months. That's about it in my world. Glad to see you back! Hey, got on the Arab/Paint cross this weekend! WHOOT! He was great! Very non-spooky, even though I rode him around different parts of the farm that he hadn't gotten to explore yet with chickens and other farm fowl running all around. Has decent enough manners, although he has an obnoxious "rooting" habit when you ask him to whoa, just about pulled me out of the saddle the first time he did it! That will go away with time and patience, after I figured out his little game and braced for it, he stopped doing it as often. Anyway, thanks for letting me share! I'm totally STOKED! Hoping for a quick end-of-the-year update! Just bumped into your blog and LOVE your buckskin colt. Gorgeous!